This Quality Table Skirt Allows Customers to Own Rather than Rent! See Several Styles of Throws in the E-Warehouse! Go Online Now to Order Your Attractive Table Skirt! 10 ft. diameter is designed for large 5 ft. tables. Polyester fabric is machine washable. This table skirt is manufactured from polyester material. The result is a line of highly functional tablecloths that are both attractive and durable, yet sell at discount prices. There are several advantages to ordering polyester linens over throws made from other, less durable cloth. The table skirt is machine washable, which makes it ideal for repeated commercial use. In addition, this trade show cover lasts much longer than cloths made from lighter material, such as cotton. While this table skirt is engineered for commercial use, it is also appropriate for use at home. This banquet linen is a table skirt that is versatile enough for any application! 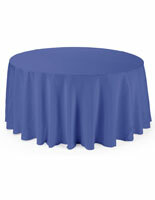 Trade show events, banquet dinners, and wedding receptions are common applications for these tablecloths. The advantage of the black color is that it allows the table skirt to fit in with any décor or scheme. 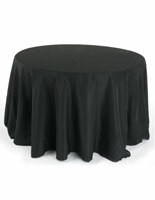 The tablecloth linen is circular in design and has a 120" diameter. This throw, table skirt is designed to drape over the side of tables, almost to the ground. 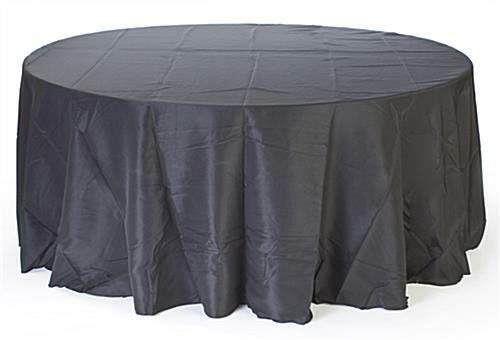 This feature provides a deluxe or luxurious look, when compared to shorter tablecloths.